What a wonderful way to start out the Quilting season. I just spent the weekend at the Angels Valley Retreat Center with the Pins & Pine Needles Quilt Guild for their Fall Retreat. This place is nestled along the Freeman river just south of Fort Assinaboine. Ab. 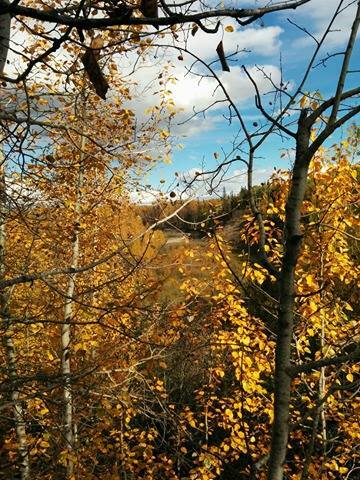 What a beautiful setting the trees are turning gold due to the recent frost. Not to mention that there is barely any cellular service or internet reception so a full weekend of technology free other than our computerised sewing machines..
We had a great group of girls in attendance 18 in total. Karen Bialik of Fabric Addict was our invited instructor for this retreat. She shared tips and techniques that she has learned over the years as well as her many quilts that she designed. I really enjoyed getting to know her in person and not at a quilt show. We were able to visit share ideas and stories. On Friday afternoon we all set up our work stations. Once I was set to go I decided I would work on Baby blocks… Never again will I make this project it required entirely too much hand sewing. It would not be too bad if my hands didn’t turn numb when holding a needle. But I got her done. Even though there was no internet access and the cutting measurements and how to make directions were on a website that I had no access to. After supper Karen Had her Store set up in the Church part of the center she gave us a bench show. She brought many beautiful creations that she or her daughter had made. I think that each guild member went home with something from her traveling store. She brought us many beautiful kits, patterns, fabrics and some notions. Saturday morning I worked on a block panel that was pulled from my stash. During the night I got a brain fart how to work with the 4 fabrics that I had brought for this project. So as soon as I got breakfast was finished. I set forth cutting the blocks and alternating blocks and cutting out the applique to embellish this quilt. I took inspiration from the fabric for the alternating blocks. Later I’ll add sashing and borders. By 10 am it was time for our demonstration from Karen on how to go about making ““Our Hearts Must Go On” quilt. (Karen’s Pattern). I decided that I would make mine with black and white and white and black with fushia for the hearts. Karen also showed us how to work with our 60 degree rulers to make her patterns Frenzies. This is one of the runners that Joan a fellow guild member made with these patterns. They are quite a hit… quick and easy to do and a good way to use up those border fabrics. I have a habit of taking off the pieces from my design wall and keeping them in order by holding them in my mouth till I get to the work station I got caught this time. After a fun weekend including visiting, shopping, games and sewing it was time to pack up but not before doing a show and tell. This is how far I got with my project. All that needs to be done now is to add my borders, sandwich and quilt. This Quilt is destined to be a wedding gift. I’m feeling rejuvenated and ready to sew and get on with the many projects that I have set forth for the winter. Previous Quilt show purchase brings my mom to tears. Next Sunday after noon project. What a beautiful quilt Renee! Hope you don’t mind I saved a picture of it. What is the name of the pattern? Our hearts Must go on. if you click the name in the blog it will take you to the craftsy site that Karen is selling it at.